During Asana practice, most of the time it’s the physical aspect of the practice people focus on, because that’s what is seen: how flexible, supple and strong we are. However, how we breathe, how we feel the breath and how we coordinate our breathing with our movement is more extraordinary. In our Yoga practice we concentrate on the body, breath and mind. Although it’s possible for them to operate independently, the purpose of yoga is to unify their actions. Patanjali’s Yoga Sutra (2.46) describes an asana as having the important quality of both sthira (steadiness and alertness) and sukha (the ability to remain comfortable). Without both, there is no asana. Of course being alert and comfortable takes time, hence we must practice and the most direct way to sthirasukhamasanam is through the breath. When we go into a posture that feels tense, it’s difficult to notice anything apart from this tension which takes us further from our asana. Maybe we are not ready for this asana; we should practice something easier. In some yoga styles, for example Bikram Yoga, we follow a specific sequence of 26 postures, we want the benefit, there’s not a lot of room for substituting or modification, so we get on with it. What if we could make our practice easier? The first thing we must do is accept where we are and what we have: be that an injury, a stiff body, a supple body but short breath or a strong body but wandering mind. Yoga is as much a practice involving the breath, as the body and the quality of the breath is extremely important. If we are in pain, it shows in our breathing. If our mind is distracted, we lose control of our breathing. The true quality of asana is measured in the body, breath and mind by their union. Usually our breathing is automatic; if a beginner came to class and was not instructed to breathe, they would do so anyway and get through class fine, hopefully by the end becoming more aware. The first step is to consciously link breath and body and we do this through movement. Finding this natural link is the most important aspect of asana. Think of raising your arms during an inhale and lowering your arms during an exhale. Both physical movements amplify or make easier the movement of the breath but we must be conscious of how and when, to get the most benefit. Watch this 3D view of the diaphragm during respiration by Sohambliss on youtube. During exhalation the ribs sink while the diaphragm rises and the stomach moves towards the spine. The same movements happen internally during a forward bend. So in order to maximise the ease of both the breath and the posture, we should exhale during forward bending. To clarify, a forward bend is any time we bring the body towards the legs or the legs towards the body. In the same way, consciously combining an inhalation with your backward bend expands the rib cage, raising the chest, causing the spine to lengthen, allowing you to move easier and more effectively into the backward bend. During twisting postures, as the spine and chest rotate, the space between them is reduced, the diaphragm moves upward and the abdomen is slightly compressed. So marry the movement with an exhalation and ease and depth will naturally follow. When we expand the body we inhale. When we contract the body we exhale. The breathing should initiate the movement. The length of the breath determines the speed of the movement. With practice, the integration of breath and movement becomes natural. Now that we’re conscious of our breathing, we should also start to focus on how we breathe and the depth of our breath. Some people only breathe in the abdomen, without expanding the chest. Others hardly use their diaphragm, breathing only into the upper chest. If you are tense or have a breathing condition, your breath may be further restricted without much movement in the chest or abdomen. 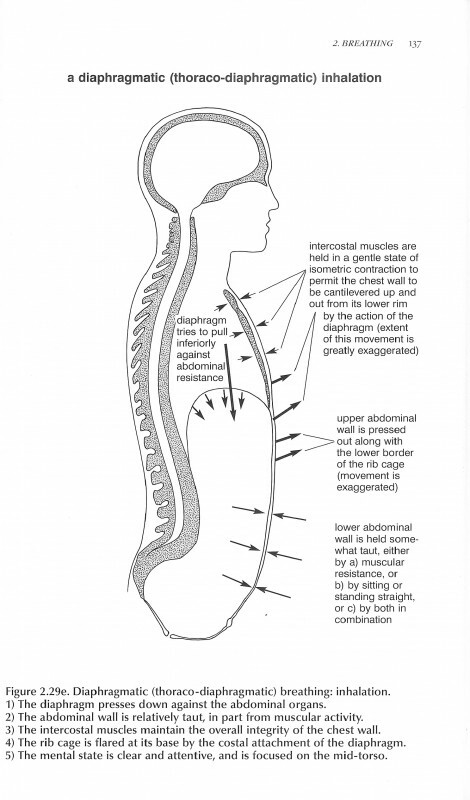 The technique for gaining a fuller and stronger breath consists of consciously filling the chest and then the upper abdomen on inhale (imagine your rib cage expanding upwards and outwards) and consciously contracting the lower abdomen on exhale. This is called diaphragmatic breathing. Think upper abdomen being from bottom of the chest to the navel and lower abdomen located beneath the navel. As an exercise, lie down on your back, place one hand on the border between the rib cage and upper abdomen with the other hand on the lower abdomen. Relax and become aware of your natural breath for a few cycles. Now try breathing using the technique above. Don’t be discouraged if you don’t feel much movement in your rib cage. Stretching, moving and exercising the intercostal muscles (between the ribs) is not like building a bicep with a weight. It takes time, but that’s OK, time builds patience with your body and exploration in your practice; Yoga is not a race but a lifestyle. From depth we must explore the feel and quality of the breath. Following the movement of your breath is a form of meditation which will help you keep focussed and calm during your practice. In order to produce a fine, smooth feeling, narrow the flow of breath at the throat to produce a gentle breathing sound. This technique is called ujjayi; it allows us to both feel and hear the breath as it becomes deeper and longer. There should be no effort or tension created while practicing ujjayi. It will take some practice but when mastered, it helps us to keep our mind focussed (rather than wandering) and becomes a tool to let us know if we have pushed too far. You’ll know you have pushed your limit when you end up playing catch up with the breath and the quality of the next asana suffers. So anytime you feel you need an extra breath, take one and possibly a break; be patient with your body. Staying within the “comfortable breathing zone” doesn’t mean you’re not going to improve, in fact you will improve faster because you will spend more time in the “Yoga zone”. It wasn’t until I was approx’ three years into my practice when I started to focus on my breath. Who knows, just like every other sports orientated yogi, I was probably hell bent on results. Now my breath guides my practice (almost completely) and is the first thing I advise beginners to Yoga. If you focus as much attention on your breath as you do on how your asana “looks”, your practice will profoundly change. Make your goal to breathe calmly and smoothly, in and out your nose while practicing asana. Remember sthirasukhamasanam. If you have to open your mouth to breathe, it’s an indication you have pushed yourself too hard. Breath control is not a technique to strive towards, it is a place to begin and maintain.